Replacement pad for Purrfect Angle scratcher. This product comes in a pack of two corrugated cardboard inserts that fit the coveted Purrfect Angle scratcher. Each Purrfect Angle pad is 19" x 8½" x 1", and is designed to fit the Purrfect Angle scratcher; however, this pad works excellently as a horizontal scratching surface, placed directly on the floor. Tip: Hide one or two of these pads around the house for your cat to discover, and be amazed. 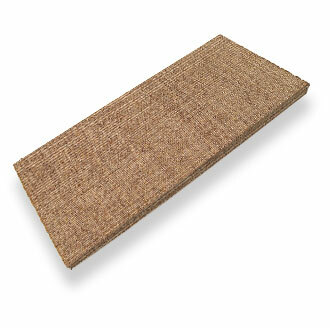 Click here for the sisal angle replacement pad — available in regular or Sophisticat™. Cats shown testing the Purrfect Angle cat scratcher. The Purrfect Angle gives cats the freedom to stretch in many comfortable ways as they satisfy their natural scratching instinct, and can be found at purrfectpost.com. My babies love this pads for purrfect angle scratchers. They loved your products . Try another scratcher they didn't like it.at all.